NETWORK FINALS: EMPIRE, THE GOLDBERGS and SVU gained 0.1 in final numbers, but both ARROW and SUPERNATURAL dipped the same. CABLE HIGHLIGHTS: It was TNT’s turn to lead cable on Wednesday with its Golden State vs. Oklahoma City NBA PLAYOFFS game at 3.11, and once again it followed the game with an episode of DUNK KING, this time at 0.76. Although behind basketball, NBC Sports Net kept the sports motif going with its NHL PLAYOFFS game at 0.65, and Univision’s LIGA soccer match was at 0.42. MTV’s THE CHALLENGE ticked up to 0.44. On Bravo, REAL HOUSEWIVES OF NYC gained 0.02 to 0.44, and THERE GOES THE MOTHERHOOD dropped a tick to 0.13. On HGTV, PROPERTY BROTHERS ticked up to 0.39, HOUSE HUNTERS was up the same to 0.35, HOUSE HUNTERS INTL fell 0.06 to 0.32, and LISTED SISTERS was up 0.01 to 0.28. Discovery’s BERING SEA GOLD climbed 0.03 to 0.38. 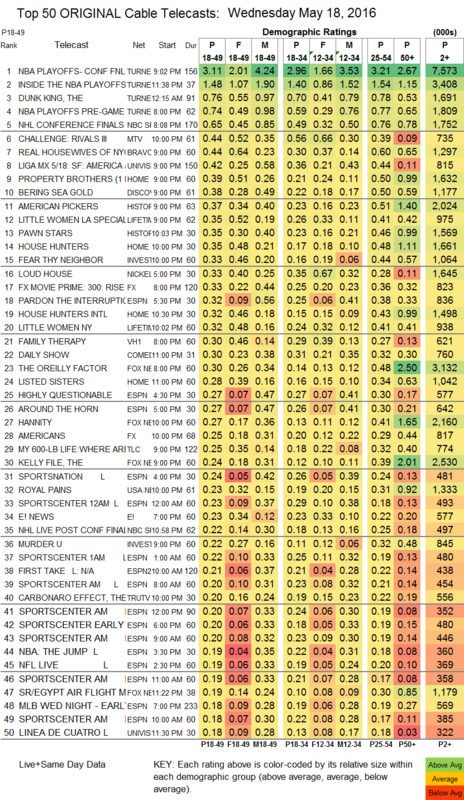 History’s AMERICAN PICKERS dropped 0.03 to 0.37, and PAWN STARS was down 0.02 to 0.35. On Lifetime, a LITTLE WOMEN LA special was at 0.35, and LITTLE WOMEN NY was down 0.02 to 0.32. VH1’s FAMILY THERAPY rose 0.09 to 0.30. FX’s THE AMERICANS gained 0.02 to 0.25. TLC’s MY 600-LB LIFE lost 0.06 to 0.25. The final season of USA’s ROYAL PAINS kicked off at 0.23. Tru’s THE CARBONARO EFFECT held at 0.20. On TV Land, LOPEZ climbed 0.03 to 0.13, and THE SOUL MAN rose 0.04 to 0.11. 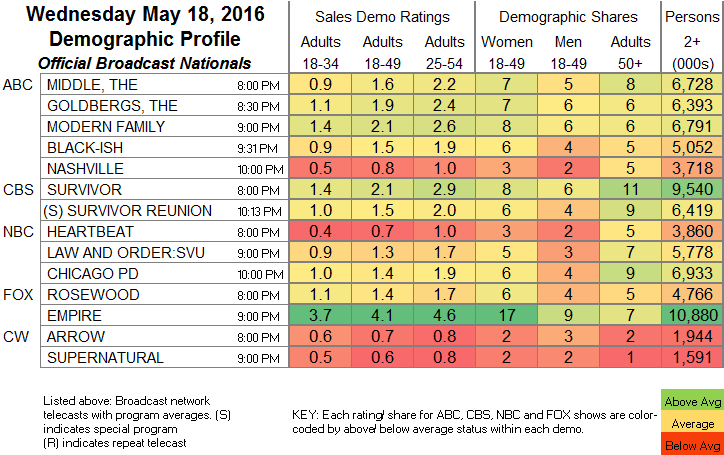 POP’s SCHITT’S CREEK dropped 0.02 to 0.06. IFC’s MARON fell 0.02 to 0.02/60K. El Rey’s LUCHA UNDERGROUND gained 0.02 in the first hour to 0.04/127K, but fell 0.01 in the 2d hour to 0.01/37K. Sundance’s THE LAST PANTHERS ended its short run steady at 0.01/38K.